I would like to encourage anyone who has any information on Deanna Cremin's murder to please use the information found in the flyer below to get in touch with law enforcement officials. 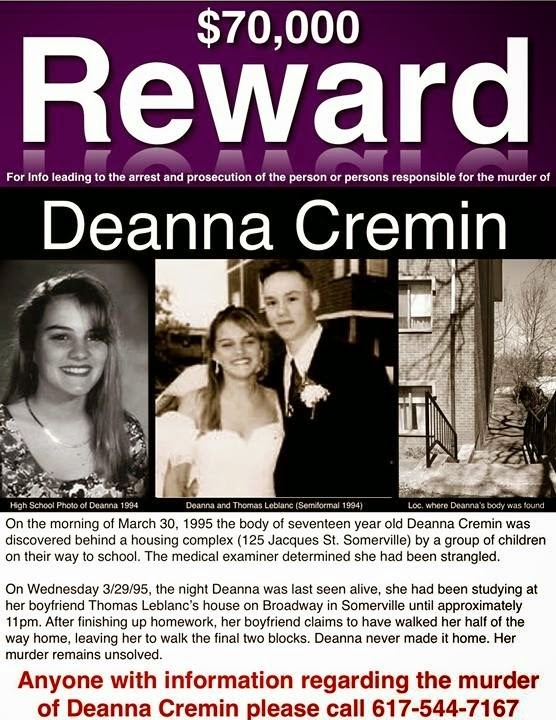 This marks the 20th anniversary of Deanna's death and it's time that we find justice for her! Just as quickly as potential candidates were being mentioned, they are bowing out of Election Year 2015. I received a text message this weekend from everyone's favorite Somerville resident, John Caruso, informing me that Elio LoRusso will be taking this campaign season off. Re-election will also not be sought by Ward 3 School Committeman Adam Sweeting, Ward 4 School Committee-woman Christine Rafal and Ward 6 Alderwoman Rebekah Gewirtz. Do join in on our on-going conversation or leave your suspicions here. After delays and confusion, I'm pretty psyched to see that 7ate9 Bakery is coming along nicely and is prepping to open this summer! Sarah's space (199c) is among a section of Highland Avenue storefronts that boasts businesses such as MF Dulock (201a), Workshop Salon (199a) and e. scott jewelers (199). This will be the final Winter Farmers Market on Saturday at the Armory! The market has been occupying the space from 9:30am until 2pm, but will be coming to a close as the outdoor market season ramps up in a month or so. Although a little late, I did want to wish Hayes Morrison, former Transportation guru for the City of Somerville, the best of luck in her new job at MassPort! Congratulations to former Ward 5ers Nicole and Ryan Dillon on the birth of their first daughter, Elinor! Noodles must be so excited! Caprese Pizzeria and Grille (Magoun Square) is under new management. Do stop by and check out what they have to offer. Please feel free to let me know how you feel about Ward 5 Online by completing this survey! You can leave your name and information or complete it anonymously. Tomorrow is the "download" day for comments on the Zoning Overhaul website. OSPCD would like to gather all ideas and comments to disburse to the members of the Board of Aldermen for processing and discussion. Should you have ideas, be sure to send them along to the Board.